Scattered Comics is an indie comic publisher located in Sacramento, California. 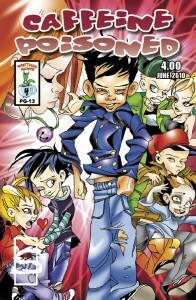 Established by Jason Dube, Scattered publishes comics that have a broad range of genres and appeal to all age groups. Here are a few of those titles available here at Comixpress. “Panda Days”: Introduces Panda, the name of a sweet and adorable girl who has two problems; she is constantly being attacked by random ninjas; the other problem is nobody can see them but her. This light-hearted comedy is loved by kids, but treasured by teens. The ComiXpress host server has moved this weekend, and we have already experienced a couple of brief outages during the move. We’re hoping the worst is past, but if you do experience any errors with our server this weekend, please let us know.